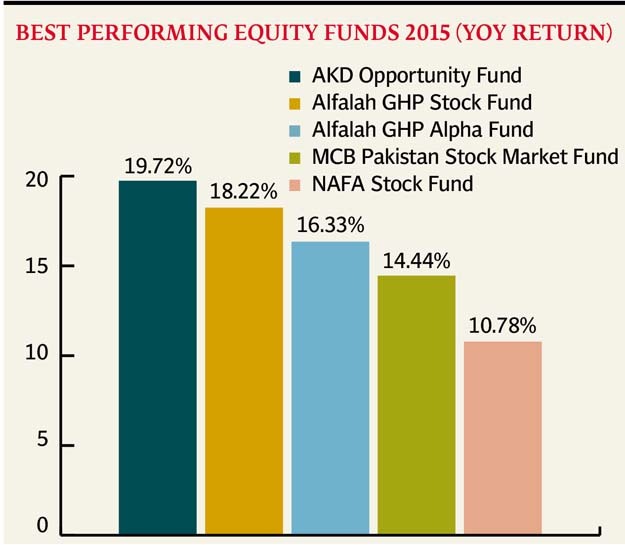 KARACHI: AKD Opportunity Fund was the best-performing equity fund last year, as it posted an annualised return of 19.72% in 2015. An equity fund is a kind of mutual fund that trades mainly in stocks to maximise returns for its retail and institutional clients. One of the 19 equity funds that were operational for the entirety of 2015, AKD Opportunity Fund had Rs1.3 billion assets under management at the end of November, according to its latest fund manager report. 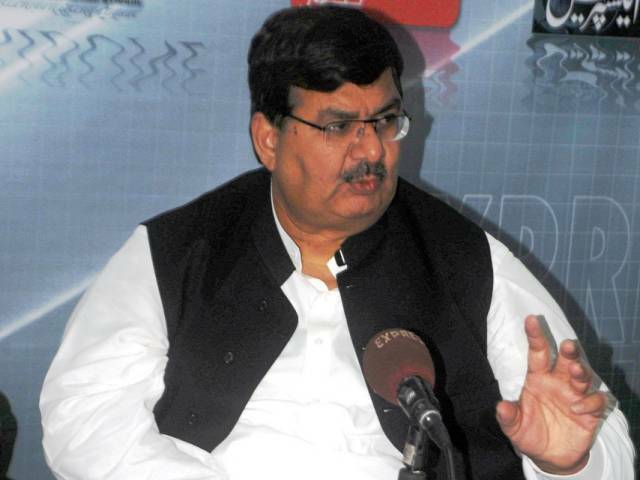 It is managed by AKD Asset Management, which is a relatively small player in Pakistan’s asset management industry whose total assets under open-end funds amounted to Rs464.2 billion at the end of October. The second best-performing equity fund in 2015 was Alfalah GHP Stock Fund. Its investors received a year-on-year return of 18.22% in 2015. It is managed by Alfalah Investments, the asset management company in which Bank Alfalah controls a 40.2% stake. Alfalah Investments also manages Alfalah GHP Alpha Fund, which remained the third-best performing equity fund in 2015. It posted a return of 16.33%, outpacing MCB Pakistan Stock Market Fund (14.44%) and NAFA Stock Fund (10.78%), which were last year’s fourth and fifth best-performing equity funds, respectively. The Karachi Stock Exchange (KSE)-100 Index gained just 685 points during 2015, resulting in a meagre annual return of 2.1%. The dismal increase in the KSE-100 Index last year is in stark contrast with the gains of 38%, 38%, and 33% in 2012, 2013 and 2014, respectively. No wonder as many as nine of the 19 equity funds operational during 2015 posted a return that was less than the corresponding rise in the KSE-100 Index. The KSE-100 Index is typically the benchmark for most conventional equity funds operating in Pakistan’s capital market. The worst-performing equity funds in 2015 were First Habib Stock Fund (-1.25%), First Capital Mutual Fund (-0.16%) and PICIC Stock Fund (0.15%). So how did the best-performing equity funds post such handsome returns despite a bearish sentiment that prevailed for the most part of 2015? The secret lies in the sector-wise allocation of assets under management: best-performing equity funds in 2015 had disproportionately high exposure to cement, power generation and distribution and automobile sectors. Oil and Gas Development Company appears to be the most favourite stock, as each of the five best-performing stocks had a major holding in the index heavyweight at the end of November. Engro Fertilizers, Lucky Cement and DG Khan Cement also dominated the portfolios of these funds, their latest fund managers’ reports show. Out of eleven Islamic equity funds operational throughout 2015, as many as four funds underperformed the KMI-30 Index, which is typically the benchmark for Shariah-compliant equity funds in Pakistan. The best performing Islamic equity funds last year were Alfalah GHP Islamic Stock Fund (23.24%), PIML Islamic Equity Fund (14.76%) and ABL Islamic Stock Fund (13.24%). Income funds are another kind of mutual funds that invest in a variety of instruments, including government securities, which are less risky than stocks-only mutual funds. Roughly a quarter of the assets of open-end funds belong to income funds. Out of the 28 income funds operational during 2015, the highest return was posted by NAMCO Income Fund (49.89%), which is managed by National Asset Management Company. The fund’s net assets amounted to just Rs3.4 million at the end of November, which makes it a relatively small player among income funds. Speaking to The Express Tribune, National Asset Management (acting) CEO Ali Nadeem said NAMCO Income Fund posted an unusually high return in 2015 after it managed to sell a debt instrument that it had earlier classified as non-performing. “It was a one-off gain that appeared on our books last year,” he added. Other top performers in this category of mutual funds were PIML Income Fund (13.87%) and Lakson Income Fund (12.41%). Money market funds constitute about 14% of the industry’s assets under management. These mutual funds have exposure to debt instruments and are considered safe investments. PICIC Cash Fund (8.94%), ABL Cash Fund (7.82%) and JS Cash Fund (7.61%) were among the top-performing money market funds in 2015. Published in The Express Tribune, January 7th, 2016. Well if you are allowed to manipulate and sell Rs9 amtex stock at 19 rupees to EOBI then obviously you will be the best performing fund!